In this episode we focus on how best to support patients who have cancer. Any treatment or management plan, regardless of which team is delivering it, which focuses on supporting quality of life, rather than augmenting the primary disease process. More on this in a future episode on the specifics of cancer treatments in older adults. Also worth bearing in mind 46% of cancer survivors are over 65 (American Cancer Society). Cancers increase in incidence with advancing age plus by definition survival leads to old age. Palliative care should be part of standard cancer care for all patients with metastatic disease and/or significant symptom burden. Minimize survivors’ distress and disability. Patients frequently state their anxieties of becoming a burden to their family and not being able to stay at home. 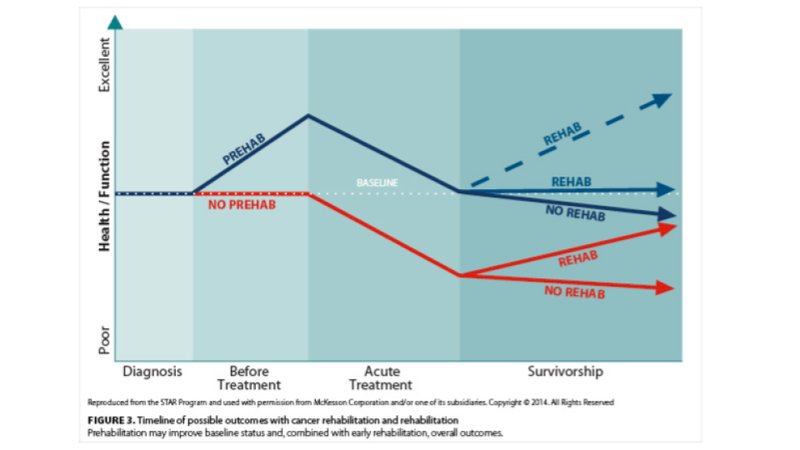 The importance of supporting preferred place of care and preferred place of death can be reinforced with a rehabilitative approach that focuses on function. Older populations are at increased risk of functional decline and frailty. For this group, small deteriorations in function can have disproportionate impact on capacity for independent living. The loss of function is interwoven with the multiple losses palliative patients experience. The therapeutic relationship developed when working with patients to regain function allows the patient to explore the meanings of these losses and reframe them in a new context. There is the need to pay attention to nutritional status in relation to function. A reduction in nutritional intake quickly leads to a reduction in functional ability. Cancer rehabilitation is everyone’s responsibility and should not be confined to specialist services. Arthralgia: particularly those undergoing hormone treatments (used for cancers that are hormone sensitive or hormone dependent) may suffer with arthralgia which can be distressing and disabling. This can be managed with standard physiotherapy management such as exercise programmes, hydrotherapy, acupuncture and advice. Bone metastases: Maintaining mobility is important for many patients, treatment for someone with known bone metastases should be on an individual basis and it’s important to use mobility and strengthening goals where appropriate e.g. avoiding high impact activities. New localised pain may be a sign. 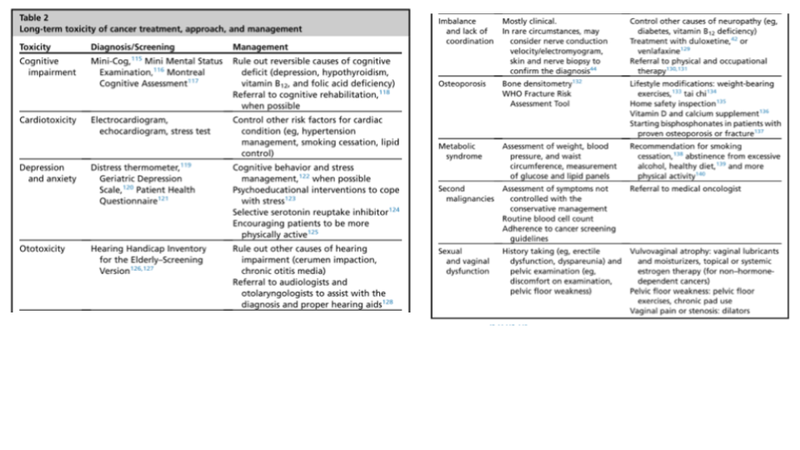 Continence: particularly with pelvic cancers. People who have received pelvic radiotherapy may experience continence issues several years later. Lymphoedema: as a result of lymph node infiltration or surgery. Unlike ‘usual’ lymphoedema, this can often affect upper limbs in those who have had breast cancer in particular and OT may be able to help with strategies associated with, pain and reduced ROM for example. Nerve damage: Peripheral neuropathy is a common side effect of chemotherapy treatment which is often temporary but in some instances may be permanent. Surgery for cancer treatment may also lead to nerve impairment. Osteoporosis: Some cancer patients, for example those with breast, gynaecological or prostate cancer, are at increased risk of developing osteoporosis due to the treatment they have received. Pain: Musculoskeletal (MSK) pain can occur as a result of cancer or its treatment. This MSK pain can be assessed in the same way as other MSK problems and often responds well to physiotherapy, particularly in conjunction with input from other members of the multidisciplinary team (MDT). 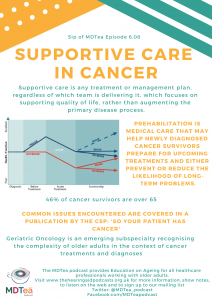 Psychological issues 80% of patients have anxiety and depression following a cancer diagnosis but often physiotherapists can help a number of these patients by addressing their symptoms and maximising daily function. Occupational therapy for adults with cancer: why it matters. Pergolotti et. al, Oncology 2016. There is evidence that the diagnosis of cancer provides a “teachable moment”, when discussions about physical activity are likely to be well received by the patient. Many people need support to change to a healthier lifestyle, especially with physical activity as they may be fatigued, lack confidence and are anxious about causing damage. Physiotherapists are in a unique position to support people to become more active. Adults with cancer are at a higher risk for functional limitations, poorer QOL, and falling. Poor QOL and functional limitations are associated with decreased ability to complete full treatment, increased risk of receiving a less intense treatment regimen, increased risk for chemotherapy toxicity, and, in turn, decreased survival. In patients with metastatic disease, one in five adults with cancer reported cognitive difficulties and 66% reported functional deficits. Adults stated they had difficulty with bending, stooping, lifting, and getting out of bed and they needed help with ADLs often. 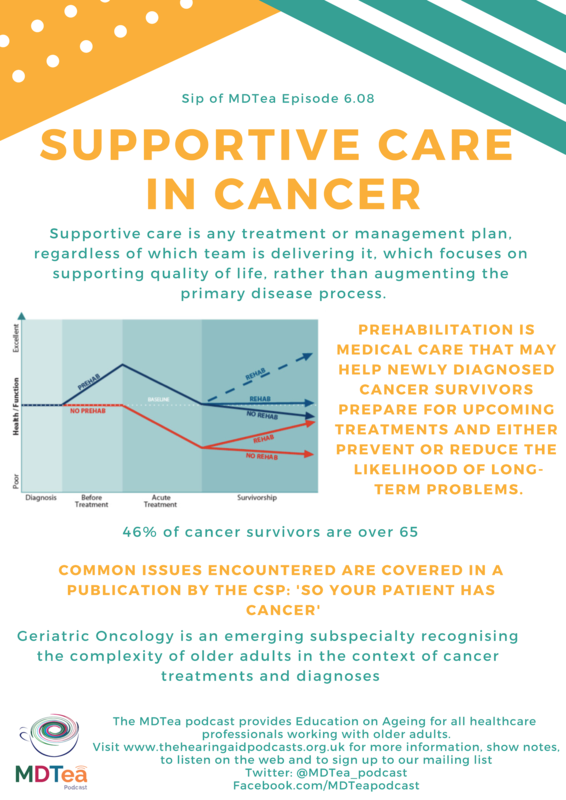 Prehabilitation is medical care that may help newly diagnosed cancer survivors prepare for upcoming treatments and either prevent or reduce the likelihood of long-term problems. Prehab focuses on effort to reduce physical impairments, functional disability, pain and emotional distress. This, in turn, may reduce direct and indirect healthcare costs and ultimately improve health-related quality of life. Improve cardiovascular, pulmonary, and/or musculoskeletal function. Improve balance and reduce the risk of falls. Reduce anxiety and improve coping with specific cognitive behavioral strategies. Improve quality of sleep with sleep hygiene education. Optimize surgical outcomes with smoking cessation interventions. Optimize diet with nutrition counseling. Begin preoperative pelvic floor muscle strengthening to improve continence outcomes. Begin pretreatment swallowing exercises to improve swallowing outcomes. Implement home safety strategies to avoid falls. Facilitate return to work with adaptive equipment. At all stages, opportunities should be taken to assess for care needs both of the individual and any carers, as we’ve discussed in previous episodes.